Earlier this month, the Toronto Maple Leafs hosted their annual Canadian Armed Forces Appreciation Night, and helped welcome home Corporal Jeremy Hillson to surprise his family during the ceremonial puck drop. There wasn’t a dry eye in the Scotiabank Arena. Now, an Ontario Hockey League team has followed suit, and helped a member of the US military’s National Guard surprise his family ahead of their game at the Dow Event Centre on Saturday night. 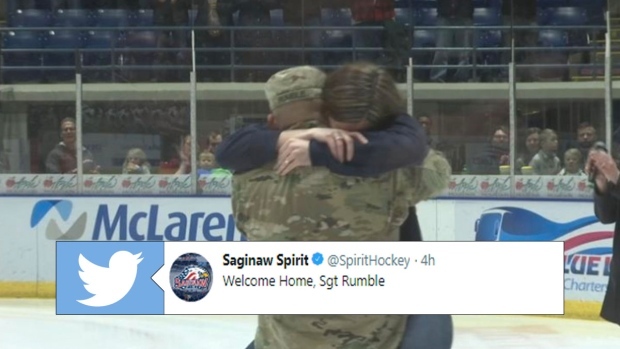 Ahead of a heavyweight Western Conference tilt where the Saginaw Spirit played host to the league-leading London Knights, the Spirit helped Sargent Chris Rumble surprise his wife and kids in what would be one of the most memorable moments of their entire lives. After a message on the scoreboard where Sgt Rumble apologized to his family for not being able to make it to the game, the public address announcer in the rink asked to fans to join him in welcoming a special guest, paving the way for this fantastic reunion. Yeah, we’re definitely going to need a tissue. We also think that Rumble might have brought some luck with him from Cuba, as the underdog Spirit rallied to beat the London Knights 6-3, who, before this game, only had eight regulation losses all season. It was definitely a feel-good night all around in Saginaw, especially for the Rumble family.